on the application as it applies to your ORI Code. It typically takes only minutes to complete the process for a fast turnaround in our office that is open Monday through Friday with extended hours, Saturday and Sunday by appointment and mobile service available. After submission to the FDLE, you can expect an abbreviated processing time of 24-72 hours. Our direct connection streamlines the process vs. other manual submissions. Our technology allows us to immediately address any errors or misprints at the time of service in order to avoid any delays. Reprints and photo adjustments are made on site prior to submission for fast and reliable fingerprinting and live scan services. You can have confidence that all submissions are encrypted to provide for secure services. Your privacy is very important to us and we take this very seriously. All transmissions of any nature to authorized government agencies are done so with the highest level of encryption. 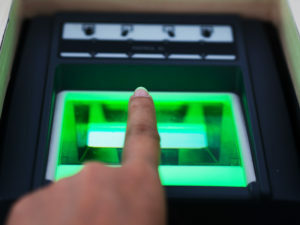 It is fast and convenient to get your live scan fingerprints and photographs. It typically takes less than 5 minutes to complete the fingerprint scans in our convenient Tampa Bay area location. We offer screening for a wide range of businesses and take walk in appointments or we can schedule a mobile service call for your business like schools, real estate and construction services. If you would like to make an appointment for preferential treatment click here. Fingerprints are electronic – we don’t use ink! Fingerprints are scanned and checked for errors. Fingerprints are immediately submitted to FDLE and assigned to the correct agency such as AHCA or DCF. Approximate turnaround time is 24-72 hours depending on the governing agency. Applicants will receive a transactional number that acts as a confirmation number at the end of the registration process. This number should be retained for tracking purposes should applicant reach out to the corresponding agency for background results. All results are sent back to the corresponding agency and not to Omega Live Scan. We do not review or receive results back from the state or regulatory agency. The Florida Department of Law Enforcement (850-410-8161) requests that applicants wait for 3 to 5 business days to receive their results. You may reference your transaction number supplied by Omega Live Scan if you need to contact them. There are no refunds under any circumstances once a scan has been submitted. It is important that you provide Omega Live Scan with accurate information at the time of service including the valid ORI number and employer (if applicable). ORI numbers cannot be changed or updated once submitted so it is important to know this prior to coming in.